Teaching Without Walls: Life Beyond the Lecture: Your Hybrid Classroom: Will You Change Your Paradigm? Your Hybrid Classroom: Will You Change Your Paradigm? I learned a lot today. As I shared in my earlier posts, a recent presentation I shared on Slideshare.net received a great deal of attention. What I'm reflecting on now is how much I was motivated by seeing my own content "go viral." I was so motivated that I uploaded another presentation just a few hours ago title, "Your Hybrid Classroom: Will You Change Your Paradigm?" This is a variation of a presentation I gave recently to a group of hybrid faculty at a near by university. Here is the embedded presentation. I do hope you enjoy it and that it inspires a few professors to embrace hybrid teaching as an opportunity to change their teaching paradigm. 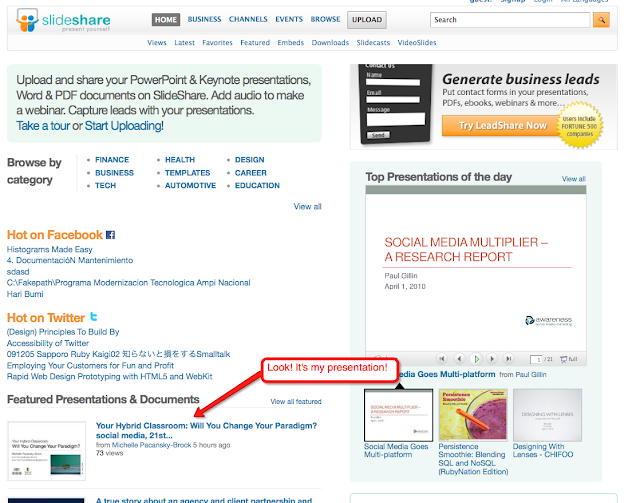 Within a few hours of posting the above presentation to Slideshare.net, I received an email from Slideshare informing me that it had been selected to be showcased on their homepage in the "Featured Presentations" area. Wow! Now I just want to share more! I think, as educators, we need to pause and learn from this, as these extrinsic rewards really to motivate one to want to do good work and share it with the world...not such a bad thing, is it? I just watched the slideshare and it was great. It also helped me understand why many teachers are having trouble adapting new technologies. They don't want to relinquish power. This whole move to collaborative learning is terrifying for those who never really learned to teach in the fist place and relied on power, control and summative assessment to survive! Hi Michelle! I'm a 6th grade language arts teacher who's planning on using more web 2.0 tools in the classroom this coming school year. I believe that education is shifting to being more participatory rather than teacher lectures, students take notes and asks occasional questions. I liked the design of the presentation - it held a lot of surprises that kept me interested -- like the questions, how they started on one slide and continued on the next, as well as the thought-provoking questions themselves. I liked the video surprise in the presentation; the professor offered some valuable information about the open classroom. I will certainly think about what I learned from this presentation when planning my lessons for next year! Anyway, I just wanted you to know that I read your blog :) It's nice to hear from our readers, and to know who's reading. Elizabeth, thank you for your comment. I shared a presentation at EduSoCal10 in which I reflected quite a bit on giving up power in quest of participatory learning. If you're interested, you can watch the video on iTunes at http://tiny.cc/ai2ui. I agree, it's scary but also very empowering after taking the leap! Mariam, thanks for your thoughtful comments about my presentation. It's great to hear my ideas translate through the slides alone, which is always a question of mine. Best of luck to you this coming year. I'd love to hear the results of your new teaching methods. Stay in touch. I am an advisor at a cyber charter school. I have students who participate in many different types of classes. We offer virtual classes and self paced classes. The self paced classes are offered to students who are in 4 year old kindergarten through seniors in high school, and virtual classes are offered to third grade students through seniors in high school. I believe that online education is great for some students, but not all students. Some students are not self motivated and they need the physical classroom setting and teacher. They need structure in their school day to meet their potential. If public schools and cyber schools joined, the combination would be hybrid schools; some online components and some traditional classroom components. I feel as though an ideal school for a student is a school which allows the student to move along at his or her own pace in subjects that are easy and interesting but provides live instruction and structured classroom time for subjects that are more difficult. The slideshow and video embedded into the slideshow helped me realize that there are people other than the ones working at my school that understand how beneficial this is to students. Hopefully many reading this blog will want to create schools that implement cyber ideas and classrooms and traditional classrooms to best help students. The internet is such a great tool and can really be taken advantage of to better educational opportunities.